Tracy Kolenchuk is the founder of Healthicine.org and author of: Introduction to Healthicine: Theories of Health, Healthiness, Illness and Aging. for doctors, medical students, and healthcare professionals,"
according to the MERCK webpage. How does MERCK view health? How does MERCK view disease? We find the answer on the pages titled: "Overview of Complementary and Alternative Medicine". In this section, MERCK describes their view of Conventional Medicine and Complementary and Alternative Medicine (CAM). "Optimal balance, resilience, and integrity of the body, mind, and spirit and their interrelationships". Which definition do you prefer? In Healthicine, health is whole, healthiness is wholeness. Normal function is simply the 'normal' occurrence of health. We can do better. We can aim for optimal health. Conventional medicine defines illness as "Disease based: Dysfunction of organs or biochemical processes" while alternative medicine defines illness as "Symptom and individual based: Imbalance of body, mind, and spirit". Healthicine includes medicine. Both views of illness are valid and important, to effectively deal with all illnesses. Conventional medicine treats illness with "External interventions (e.g., drugs, surgery, radiation therapy)" while alternative medicine treats illness with "Support and strengthening of patients' inherent capacity for self-healing". Often, the best way to cure an illness is to health it. Health is the best illness preventative. However, health is deliberate, honest and slow. When an illness is an emergency, external interventions are necessary. Both treatments are valid, depending on the illness. According to MERCK, conventional medicines are red. They fight illness, tackle disease, kill illnesses. MERCK recognizes that they are dangerous, requiring a prescription for the safety of the patient, and that they can have dangerous side effects and often kill patients. Complementary and alternative medicines are green. They create and improve healthiness, they are supportive, generally safe, and healthy. 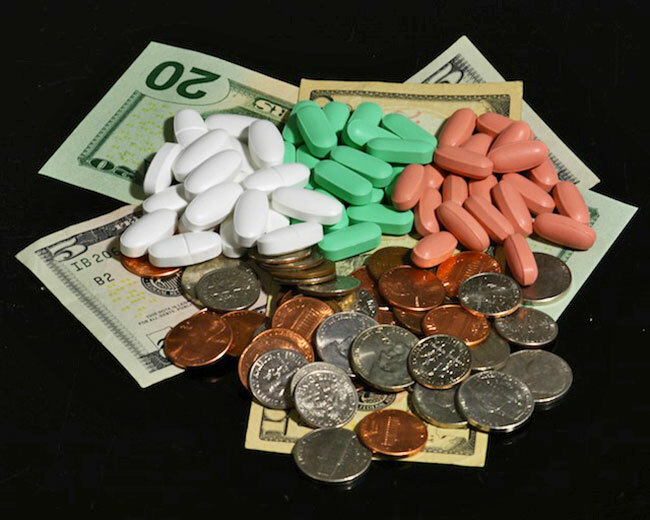 Healthicines include both conventional medicines, and complementary and alternative medicines. The descriptions in MERCK is simplistic, and as we shall see, the MERCK manual itself contradicts these definitions. There are two important errors in the MERCK summary of Conventional Medicine and Complementary and Alternative Medicines (CAM). The first error is the assumption that CAM does not include the concepts of conventional medicine. CAM is, even by the name, 'complementary' and alternative medicine. CAM accepts and includes many concepts of conventional medicine, although different practitioners of alternative medicine differ in which aspects of conventional medicine they support. The concepts of CAM take medicines further - towards healthiness. The second error made in the MERCK summary, is the belief that these differences are actually related to health and illness. They are not. The only real distinction between conventional medicines and alternative medicines is that alternative medicines are judged 'non-conventional' by some practitioners of conventional medicine. The differences between conventional medicine, and alternative medicine, as defined by MERCK, are differences in 'viewpoint'. The medical viewpoint sees everything through the lens of disease. Alternative medicine is more likely to use a 'health lens', using a disease viewpoint when necessary. Conventional medicine treats by 'fighting the disease', while alternative medicine tries to improve the health of the patient, fighting the disease when necessary or appropriate. Conventional medicine views health as the absence of disease, while alternative medicine views health as something that can be improved, optimized, even when you have no disease. Conventional medicine is the disease view. Complementary and alternative medicine is a health view. Which view is more complete? Which view is more effective? Illness is a subset, a small part of healthiness, as medicine is a small part of healthicine. It is silly, and clearly shows a lack of understanding, and lack of imagination, to claim that one view is 'correct' and the other is 'incorrect'. Both views have merit in specific situations. Each can be very effective in specific situations. MERCK, in their description of Complementary and Alternative Medicines, says "Complementary and alternative medicine (CAM) refers to healing approaches and therapies that are not based on principles of mainstream, conventional medicine." Is this really true? No. nutrition, toxicology, and physical therapy, where MERCK recommends green medicines. All studies of nutrition are based on the concepts of "balance, resilience, and integrity of the body", treatments for nutritional deficiencies are based on "support and strengthening of patients' inherent capacity for self-healing". The diseases that result from nutritional deficiencies are "Imbalance of body, mind, and spirit". These are illnesses that do not fit the model of conventional medicine, ("Disease based: Dysfunction of organs or biochemical processes"), rather, they perfectly fit the model of alternative medicines. The treatments recommended by MERCK are to health the diet of the patient, and if necessary, provide supplements. The entire first section of the MERCK Manual of Diagnosis and Therapy is about nutrition. There are many illnesses of nutritional imbalance - deficiency or excess, listed in MERCK. All of these illnesses fit the Complementary and Alternative view of medicine - none fit the 'conventional medicine' view. How many illnesses are based on nutritional deficiencies? Frankly, we don't know. There are about 20 essential micro-nutrients, vitamins and minerals, depending on who you ask. Each of which will result in a specific illness if deficient. We believe there are about 100 nutrients essential to health, but we're not sure how many, not sure if different people have different essential nutrients, not sure if our individual essential nutrient requirements change as we grow from babies to adults. So, in theory, there are over 100 simple illnesses, illnesses with single causes, that fit the Complementary and Alternative Medicine model - and do not fit the Conventional Medicine model. What about combinations of nutritional deficiency? Healthy bones require many nutrients, and bone diseases like osteoporosis can result from not just single deficiencies, but also from combinations of deficiencies and also from imbalances of nutrients. How many combinations of nutritional deficiency cause disease? There are billions (100 factorial) of potential combinations of nutritional deficiencies that might cause specific diseases - but only a few have been clearly identified by conventional medicine. There are many illnesses that are simply not understood, or where the cause is not known, documented in the MERCK manual. Many of these could be the result of complex nutritional deficiencies or excesses. The view of MERCK, creating a demarcation line between conventional medicines, and complementary and alternative medicines is an oversimplification. The view in this image, is more complete. 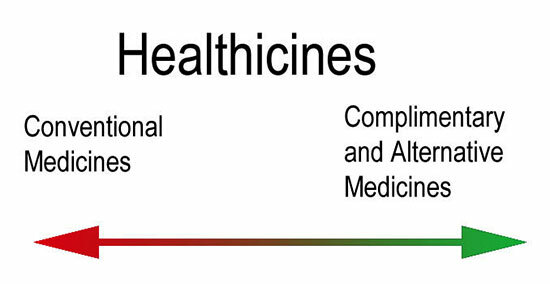 Healthicines also includes non-medicines. We don't always need medicines to improve health. Healthicines are greener than green medicines. Health is, after all, the best preventative. Opposite to the science of nutrition is the study of toxic chemicals. There are many elemental chemicals that are toxic, and potentially billions of toxic chemical compounds. We know many of them. Mercury is toxic, causing brain damage. So is lead. Many plants and animals create new chemical toxins to protect themselves from being eaten by other plants and animals. When humans consume too much of these toxins, we get different diseases. These diseases also do not fit the conventional medical model, they are not "Disease based: Dysfunction of organs or biochemical processes", the diseases that arise are not based on "Normal function (i.e., absence of specific disease or dysfunction)", rather - they are based on the presence of toxic chemicals, and the treatment is not "External interventions (e.g., drugs, surgery, radiation therapy" - the treatment is to stop consuming the poisons, and heal the damage that has been done. The correct view of these illnesses, and the correct treatments are those of Complementary and Alternative Medicine, according to MERCK, and the treatments recommended by MERCK fit the CAM model perfectly. The third case where MERCK clearly supports the concepts of complementary and alternative medicine, is physical therapy. When the best cure is physical therapy, or exercise, MERCK does not recommend "External interventions (e.g., drugs, surgery, radiation therapy", instead - it often sends the patient to a physiotherapist or a massage therapist. When the patient needs physical therapy, they don't need medicines, they need health. Conventional medicine recognizes that many illnesses are caused by stress, although it often limits the use of 'stress' to specific 'mental illnesses'. Even though it recognizes that mental stress can weaken the body and make it more susceptible to other illnesses. "Symptom and individual based: Imbalance of body, mind, and spirit". Of course some are healthy stress - and some are unhealthy stress. You might be ill because of a physical stress that broke your arm, or a mental stress that causes you to not eat a healthy diet, not get enough healthy exercise, or a stressed depressed spirit. Depression is defined as a physical illness by conventional medicine, and treated with drugs for the brain, not the spirit. Stress, in CAM, is 'imbalance of body, mind, or spirit' that can lead to illness. Healthicine goes farther, to community, recognizing that health - and also illness - can come from our communities. We can have unhealthy communities, and we can be unhealthy in our community activities. War, genocide, murder, theft and many other 'crimes' are illnesses of community, often caused by stresses on or from our communities. These illnesses are less frequent in healthier communities, and less frequent in community members who have a healthier community presence. Conventional medicine, as defined by MERCK, is a very limited view of health, of illness, treatment and therapy. This view can be limited by the desires of conventional medical practitioners to separate themselves from complementary and alternative medical proponents. Even so, most conventional medical practitioners recognize the truth at least some of the time. Proof can be found in many pages of the MERCK Manual of Diagnosis and Therapy. Conventional medicines, red medicines, fight your illness. Complementary and alternative medicines, green medicines, fight for your health. Healthicines include conventional medicines, complementary and alternative medicines, and also any substance or action that can improve your healthiness - even when you have no illness.